Everton left-back Lucas Digne has revealed that he’s relishing the prospect of facing Liverpool’s Mohamed Salah in the Merseyside derby. While he likely won’t be asked to nullify the winger’s threat alone, the pair are set to directly clash in the encounter at Anfield on Sunday evening. Given Salah’s bagged nine goals and four assists in 19 games so far this season, following on from last year when he scored 44 goals in 52 games, it’s fair to say that most defenders tasked with keeping him quiet would be a little concerned at the idea. However, Digne is seemingly unfazed by it and has insisted that he’s ready for the challenge as ultimately that’s what he’s in football for, to test himself against the best and see how he fares. “I know Mohamed Salah because I played one year with him in Rome,” Digne said, as reported by ESPN. “He’s a very good guy and a very good player, but you play football to play against the big players, against [Lionel] Messi, against Neymar. 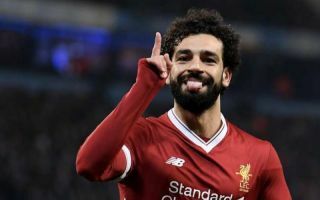 Whether or not their stint together at Roma will give the Frenchman any tips on how to keep Salah quiet remains to be seen, but Liverpool will be desperate for the Egyptian international to make his mark on the meeting to keep them hot on the heels of Premier League leaders Man City. Pep Guardiola’s men face Bournemouth at home on Saturday afternoon as they look to stretch their two-point lead at the top of the standings. If they do so successfully, then the pressure will be on Salah and Liverpool to respond against their city rivals with Digne out to ruin those plans by keeping things tight at the back.